Be warned: this is a long post. Just over a year ago (end of 2014, beginning of 2015), I completed my repairs and rebuild of my basement. I took a small corner for myself as a work/research/lab space. Otherwise known as “where I keep my junk”. The following is how my corner looked after I’d set up my 3D printer and mounted a little cabinet and a TV/monitor. My basement workspace is coming together. In order to understand how weirdly frugal I am, I present my AliExpress orders for the last year. When you work from home and are self-employed, you attempt to locate the best deals. Even if that means waiting 4 weeks for your stuff to arrive. And you buy in bulk. I’ll point out that this is only my orders, compiled, from the past year. This does not include orders from SparkFun, Adafruit, drop-ins at Creatron or Sayal or A1. I swear I’m not a pack rat. Judge my orders by their size, do you? That is there to illustrate that I was outfitting my space with “stuff” to work on. Whether or not I had a plan didn’t matter so much as having hardware on hand for any of my flashes of inspiration. One of the items I bought was 3 metres of timing belt. The initial plan was to build a second 3D printer, I think. I really don’t recall. But that makes the most sense, I bought timing belt, pulleys, smooth rods and linear bearings. I’d argue there are a lot of options for projects but they’d all revolve around moving something back and forth. I decided one of my first projects was to play with acrylic resin and cast some stuff. I was already mold-making and casting something for my father-in-law (I had the stuff on hand), I thought I’d run timing belt in a yogourt lid and try making a “big ol’ gear”. Using timing belt and a yoghurt lid as a mold for a large pulley. Gonna pour resin tonight. Excited about this. Minus some cleanup these turned out pretty good. Will be interesting to see how they mesh with a machined pulley and timing belt. One hopes perfectly of course. And it worked! I realized I had zero need for a “big ol’ gear” so I chalked that up to proof of concept. If you need a gear to match with a timing belt and pulley, there’s your solution. You’re welcome. Building a carriage system with rigid foam core and hot glue. Because that's how I roll. My current mantra is "you don't know unless you try." So far working out nicely. So I can successfully move something back and forth with my hand. I was really impressed at my ingenuity. Then I decided to get all wacky and build a Z-axis carriage. Yup. Looks like I have enough foam core for a z-axis assembly. Heh. There are glimpses of my really cool Millennium Falcon rug in that picture. You need to get one. They’re cool. Really cool. You may think your spouse loves you. Do they "Millennium Falcon rug" love you? @libselliottlife does. Merry Christmas to me! Need to solder the threaded bar to the pulley. Hopefully that will be strong enough. Unsurprising that it's sort of heavy. This, by the way, is not a good design for a foam core machine. It’s too heavy. But it worked. The following is a wee timelapse video of me soldering motor EasyDriver boards. LOOK AT THAT LINK! 4.50 FOR 5 BOARDS! ALIEXPRESS! ALIEXPRESS! The reason I needed EasyDriver boards was simple; I needed a way to control the motors moving my machine. You didn’t think I was going to push it around with my hand forever, did you? NO! I discovered GRBL and planned out the machine based on how GRBL works. GRBL, now that I’ve written it three times, is an arduino-based CNC system. It parses gCode and can move a tool around. If you don’t know what gCode is or CNC or … tools … I don’t know, get googlin’. The net result of using GRBL and gettin’ proper is a lot more wires. Hooking my boards to the motors. See how that goes. Nothing on fire yet. The z-axis. Always with the z-axis. The following video is me controlling my machine via GRBL Controller on my laptop. It’s a really big deal if you’ve been wiring things and honestly out of your depth as I so obviously was. Wrapping my head around coordinates in GRBL did a little timelapse. The mess that is a DIY 3-axis plotter. Seconds before I sent a short through my arduino, shutting down my laptop. Destruction level up! Note I beefed up my build with low tack painter’s tape. For real. You might think I'd be tired of running the homing sequence repeatedly and failing. You'd be right. Modifications today: remove half of the limit switches. Move the X limit switch off the X carriage. Rewire all limit switches. Net result? Successful homing sequence finally! Working on a plotter redesign. Wider gap in smooth rods should make for a more stable movement. Perhaps even allow for not needing a rod for the x-end. Useful to have parts to put on the design that are 1:1. I ended up bored messing with it as it was. Once I got it working, I didn’t have any reason to continue. So I did something else. I made some art. Second print for sale on Big Cartel! I made some infinity mirrors and taught other people how to make them, too. Infinity mirror workshop with @artscienceto complete! Thanks so much for having me! I visited New York and checked out Sub Rosa where Josh makes magic. Also, happy birthday to the wizard of weird @praystation! You blow me away, man. It's been an honour to call you my friend for this long. And then to whisper that we were friends before that. And then to quietly stalk you from afar before… you know let's just stick with happy birthday. "We'd like to clear your package through customs." "Sounds good." "these… batteries… are they for 'personal use'?" "Yes…?" "Ok"
1,000 vending machine balls? Check! and 1,000 LEDs and made throwies. 53 left. Fingers. So sore. I designed and executed on a big LED arduino-driven clock. LED clock all set up. Need to sand, fill and plasti dip the front assembly but I can set the time now so I decided to hang it up to get it off the floor. I designed a t-shirt for my friend Stacey who coined the phrase “Charming Dirtbag” and made me giggle for about a month because of it. I helped the brilliant Brent Marshall on a big LED-lit sign for the Grey Cup. A short video of the attract mode of the #GreyCup sign. When a fan requests their team colours the sign will change immediately. Project by Wright XM. I designed and executed a light bar after someone sent me a link to The PixelStick. Remember I’m cheap/frugal mostly so if I see a $350 USD light toy, I’ll try and build my own. If you’re not into driving yourself insane building your own and have the dough, I highly recommend the real thing. It’s gorgeous. Then I took apart some travel speakers and salvaged the actual speakers. Here’s the Imperial March through Arduino. Then, last month, I got that itch to mess with my machine. It’d sat there, disused for nearly a year. I was either going to gut it and trash the foam core or rebuild it and trash the foam core. One way or the other, that foam core had to go. So I started re-designing based of materials on hand. I had plywood lying around from bad design decisions. That’s sturdier than foam core. And away I went cutting, drilling and designing on the fly. The center placement for the motor was ill-advised, by the way. I don’t know how to competently “splice” timing belt. Sometimes you take a look at an old project. Like a plotter you built out of foam core. And you think about how wobbly that one axis was. And you start to re-design it so it isn't. Out of leftover laser cut ply you have laying around. Four L-brackets away from squaring this rig up! This is so DIY, it's silly. Then I went all cray-cray and started designing for 3D printed parts for the x-axis in TinkerCAD. The further down that rabbit hole I went, the tighter the design became. This is it assembled. It's all "well, who knows if it's gonna work." We will see. Updated the models for the x-ends. Discovered I'd mis-measured the holes and slightly increased the size of the bearing holder. Then worked to include belt connections and added some complex curves to see if I could do it. You’ll notice I designed for a servo instead of a stepper motor because all I required was up and down for a pen or similar drawing tool. And there also happens to be a GRBL implementation to do just that. #3dprinting parts fit really well! Anyone know a good implementation of #grbl with a servo instead of a stepper in the Z-Axis? Tired of testing for the moment. But here's a Minecraft pickaxe. I’m taking another break for the moment and printing up a lightsaber for my son. I have a feeling I’ll return to the plotter because I have something in mind for it to do beyond frustrate me. My TinkerCAD public files including the handle to the light bar and the modelled files for the plotter. A year later and this is my workspace. Like I tweeted to robotgrrl. 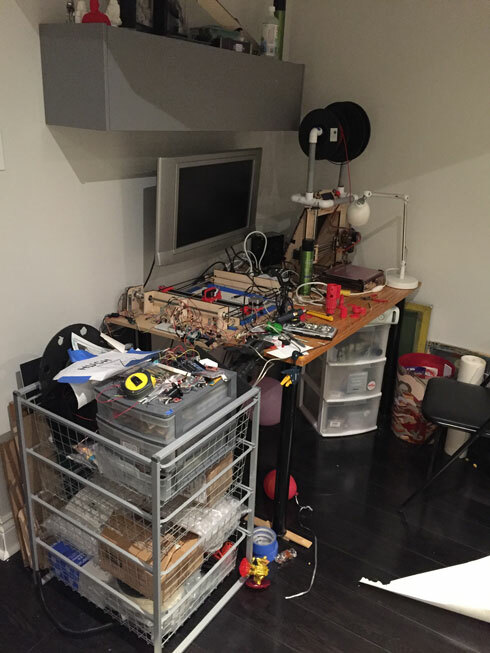 @RobotGrrl @STEAM_Labs a clean desk is the sign of a cluttered mind. NextWhat Do You Do Now?